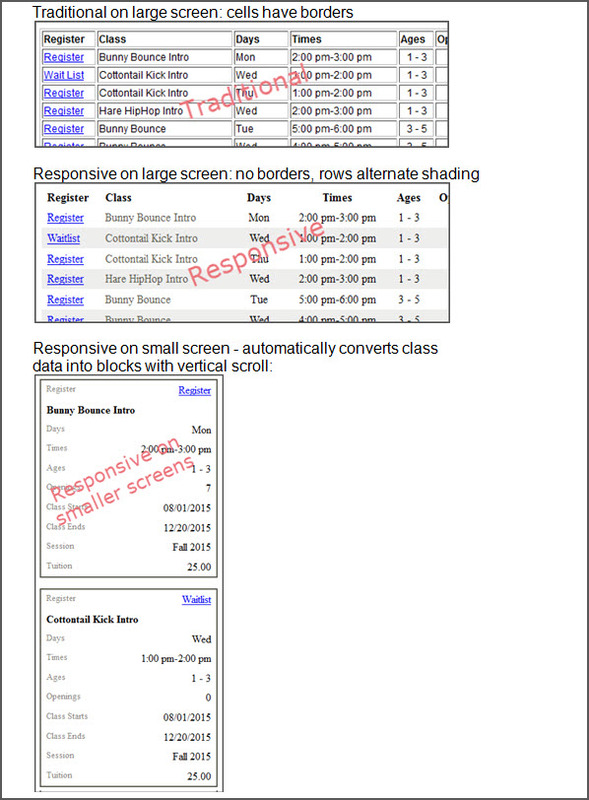 From Jackrabbit inception until late 2015, the class listings html codes provided were "traditional" codes which displayed with table borders. These codes were not mobile-friendly (meaning they didn't display well on mobile devices). In 2015 Jackrabbit developed new responsive codes that automatically transform to vertical display when viewed on small devices - assuming your website is already optimized for mobile viewing. The codes given in this Help Center are the responsive codes. This means that if you are using these codes, and your site is mobile optimized, then the tables will work correctly on cell phones, ipads, etc. Not sure if your website is optimized to be mobile friendly? Contact your webmaster. Your website may require site modifications and CSS changes to work optimally with the responsive tables. Jackrabbit can not advise how, nor update your website to be, mobile-optimized. What is the difference in appearance between the traditional code and the new responsive code? When viewed on a large screen, the difference is simply the borders and shading. However, our traditional tables do not work well when viewed on smaller screens. The responsive codes produce a table that AUTOMATICALLY adjusts to a mobile-friendly view when viewed on a mobile-friendly webpage! To see an example "in action" visit this Comparison Page.... then, shrink your screen width smaller and smaller and you will notice the new lower table will "transform" into block style format which is compatible on mobile devices. How do I change my current (traditional) table codes to the responsive table codes? Replace the XXXXXX with your specific Organization's ID number! (Find yours by going to Tools > Online Web Registration - it is shown in blue). Replace the XXXXXX with your specific Organization's ID number! (Find yours by going to Tools > Online Web Registration - it is shown in blue). As mentioned above, the domain and your custom query string portions of the code remain the same. Only the path needs to be edited to obtain the benefits of the responsiveness. If you have problems converting your current table codes into the responsive codes, see Integration Assistance article to contact the Integration Team and let us know exactly the code you are using and the webpage where the table is located, and we will be glad to take a look.